This popular Denver neighborhood is located East of downtown Denver between Colfax Avenue and 6th Avenue and Colorado & York. 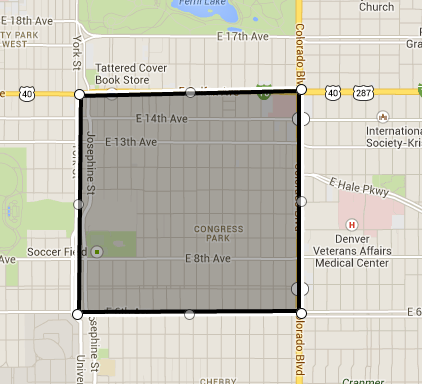 There are approximately 5700 households located in this quadrant. Congress Park is located on one square mile with residents having a median household income of $77,560 and median age is 36. Homes in this neighborhood have been built from the late 1800's to some scrapes/new builds as recent as 2010. Lot sizes tend to be smaller, but you can find lots up to a third of an acre. You will find high Walk Scores in Congress Park (80 and above) as there are many cafes, restaurants and stores all within a short walking distance. Below you will find current active listing available in Congress Park. Let me know when you locate one (or more) you would like to view.